Compatible with Aputure LS C120d, LS C120d II, LS C300d or any other monolight-style LED light with a Bowens accessory mount, the Fresnel 2X Attachment offers a beam spread that's variable from 12 to 40 degrees. A valuable bi-product of this enhanced design is its ability to intensify the output of the light! Aputure's LS 120d II, for example, is capable of outputting up to 14x its standard power thanks to the Fresnel's dual lens design. The Fresnel 2X comes with a padded case for storage and transport. The enhanced design features dual optical elements, a larger 6" front Fresnel lens, improved ventilation, and minimized light leaks. The rear lens focuses and magnifies the beam onto the larger 6" front Fresnel lens, performing with zero wasted light. The dual lens optical design makes the Fresnel 2X twice as powerful as the original Aputure Fresnel and makes the LS C120d II up to 14-times brighter. 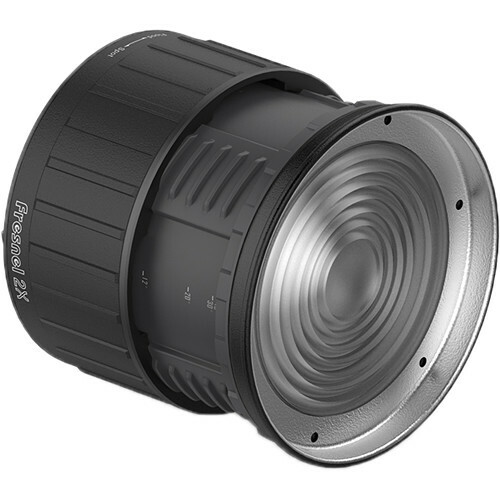 By utilizing a rotating barrel design, the Fresnel 2X creates an intuitive user experience, similar to a camera lens. The smooth focus throw gives users an ability to accurately tweak the beam angle of their light source, allowing them to easily spot or flood-out the light with a simple twist. The Fresnel 2X is adaptable to any situation. With its Bowens-mount design, This Fresnel can be attached to a myriad of lights that use this popular mount. The 7" front ring accepts the Aputure barndoors, offering a wide variety of light-shaping options. Box Dimensions (LxWxH) 8.4 x 8.2 x 6.9"
Fresnel 2X Attachment is rated 5.0 out of 5 by 1. Rated 5 out of 5 by Jaron from Improved in every way I use this with the Godox SL-200 with bowens S mount and it works perfectly with that light as well. Note: it fits the Godox barn door kit GOBD04 perfectly as well. Whether they meant to or not, this is a very compatible product. Everything about this fresnel is improved over the original. Output is stronger, beam is cleaner, action is smoother and most important - there is WAY less light leakage. The original unit got hot and needed a lot of black wrap to control spill, this gets to about the same temp but doesnt need all the extra junk. That make it a lot faster which is a welcome improvement. Its a little more money than the old version or competitors but well worth it. Plus it comes with a nice case now which probably makes it (all things equal) about the same price. Is this compatable with Godox strobe with a Bowen&rsquo;s Mount? Yes, this fresnel attachment is compatible with Godox strobes that have a Bowens S mount. Can you mount barn doors on the front of this fresnel lens? You can use clip on barndoors designed to attach to a 7&quot; reflector.